Our schools provide experiences that meet the children’s needs and simulate learning in all developmental areas such as; Physical, Social, Emotional, and Intellectual. Children are naturally curious about their environment, and this provides the motivation for exploration and discovery. The mastery comes through repetition, which helps to develop the child’s self-esteem, and positive attitude towards the learning process. The Child has one intuitive aim: Self-Development. He desperately wants to development his resources, and learn for himself, through his own senses, and not through the eyes of an adult. The Child, who accomplishes this, moves himself into harmony with his world. He becomes a full person. He is educated..
To provide affordable, convenient, dependable Child Care Services. 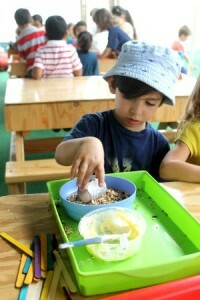 -To create a Child Care setting for social, cognitive, and physical development. -To provide a nurturing environment. -To provide learning experience for our children. -To provide a facility for the existing Pre-School. -To provide a before and after school and summer programs. Our staff of warm, caring, professional Childcare providers maintains a positive and stimulating atmosphere where your Child is cared for and respected. Your Child is very special, and it is our goal to attend to all of his/her needs, personal and developmental. You are an important part of our “Media Center Montessori Pre-School and Infant/Toddler Center”. Media Center Montessori Pre-School will provide a program of guest speakers. Special activities being brought to our program, along with extra curriculum that includes Karate class, Spanish class, French class,etc… there is a no extra charge for these classes. 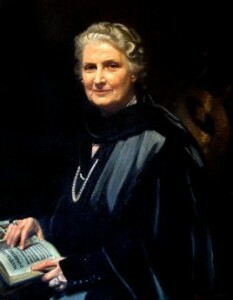 She was the first woman in Italy to be admitted to medical school. Born in 1870, she was the only Child of a prominent family. She opened a clinic for children with learning disorders and psychological disorders. 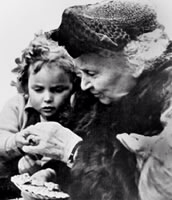 Here, she observed the need for intellectual stimulation, and began to design her unique didactic materials now known as: “Montessori Equipment”. By bombarding the intellect through all of the senses, the Child learns easily and at a rapid pace. It is a “kinesthetic” (hands-on) approach to education that takes into consideration the entire potential of the Child: Mental, Social, Intellectual and Physical. By employing the use of concrete materials, abstract concepts become understandable, and thus the Child is given the opportunity to pursue his interest, without the frustration so common in traditional classrooms.Because he can choose, he is free to use his instinct for repetition to “Master the skills necessary to thrive academically, and in all other ways”. 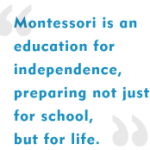 Media Center Montessori Schools use Montessori materials that are relevant to the Child’s life experience. Montessori materials offer the Child a built-in control of error, so that he/she may know the joy of finding the answer on their own. All subjects are inter-related; the Child draws a picture (art) telling a story (oral language), writes down words (written language), and counts the number of objects (math) and so on. The children learn to observe, experiment, and to care for their environment themselves. They are eager to work and this we call, the Child’s work. They enjoy sequential activities on an individual basis and in groups. We use the phonetic approach to reading, which begins as soon as the Child has demonstrated his/her sensitive period, usually around the age of three. The Child may begin by learning the sounds, tracing, lower case letters on sand paper letters. Eye-hand coordination exercises (sorting, pouring) help the Child to develop pencil control. Sensory training allows the Child to learn to discriminate colors, size, weight and between length differences. Math begins with counting, identifying numbers, attaching numbers to quantities, and so on. 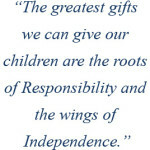 We encourage each Child to proceed as their abilities allow, and offer support, encouragement and assistance as needed. We serve the Child.